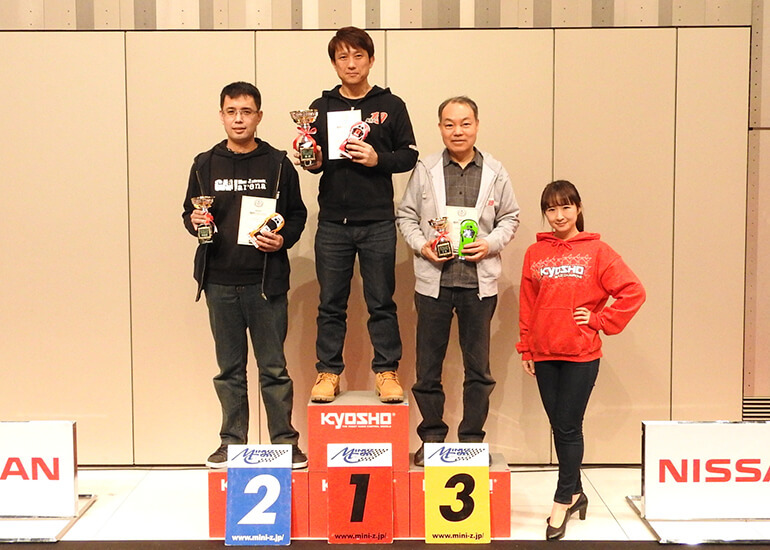 The masters of MINI-Z from each region gathered to decide who would become Japan’s No.1 for the 16th KYOSHO MINI-Z Cup Final Championship 2018. 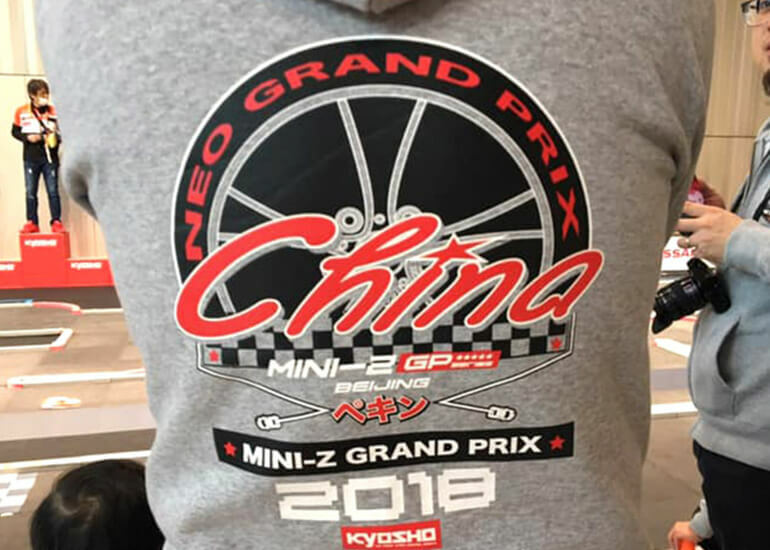 Having qualified from 7 blocks through official MINI-Z races in Hokkaido / Kanto / Chukyo / Kansai / Kyushu and two MINI-Z Meetings held in Kanto & Kyushu, racers were invited to the sacred Nissan Global Headquarters Gallery to contest the Final Championship. 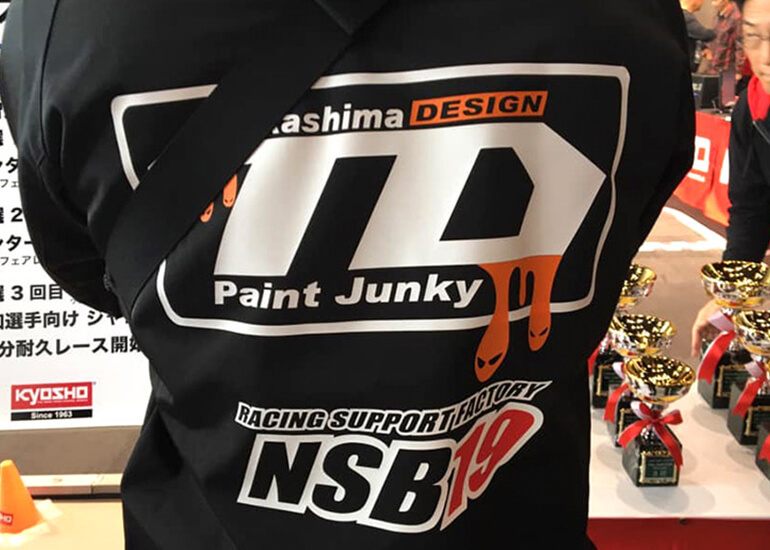 As expected for a final, competition was at the highest level in each of the 7 racing classes: Production; FWD; Narrow Touring; Wide Touring; Open; Drift, and Buggy. 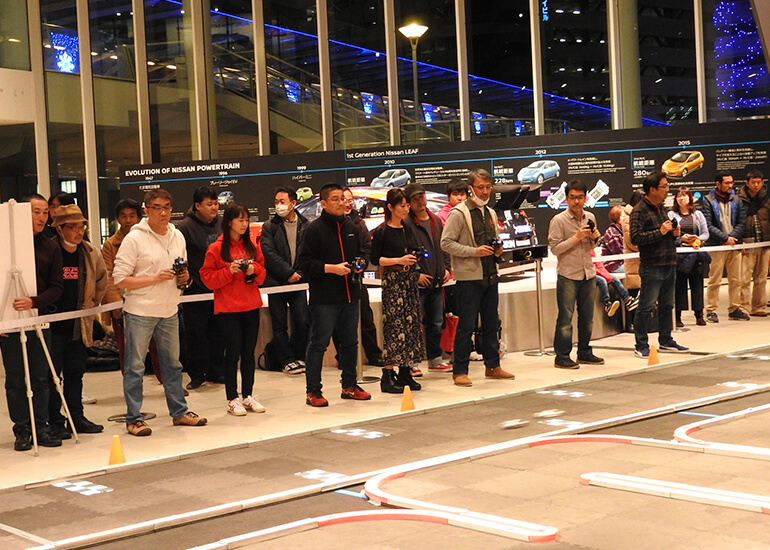 In addition, the first day featured a special “MINI-Z 40-Minute Endurance Race” to determine Production class representation and the second day featured the “MINI-Z Nissan Fan Class” for women and beginners to join in. 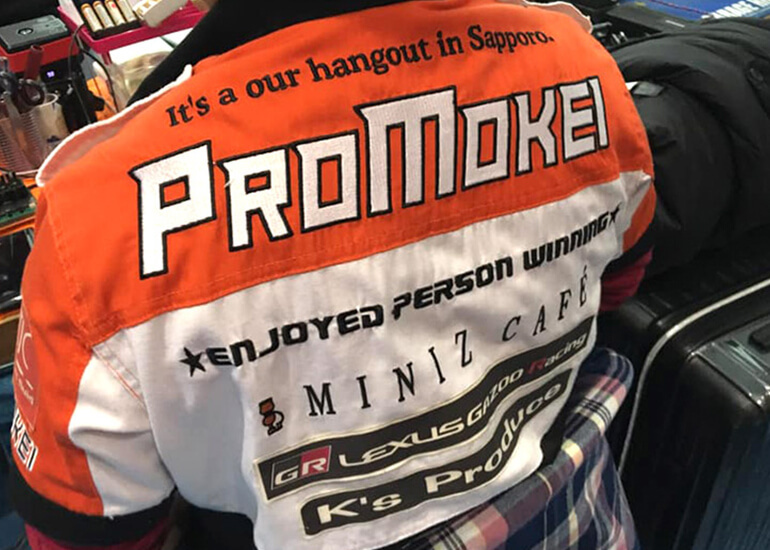 The party atmosphere of the 2018 Final Championship was electric! 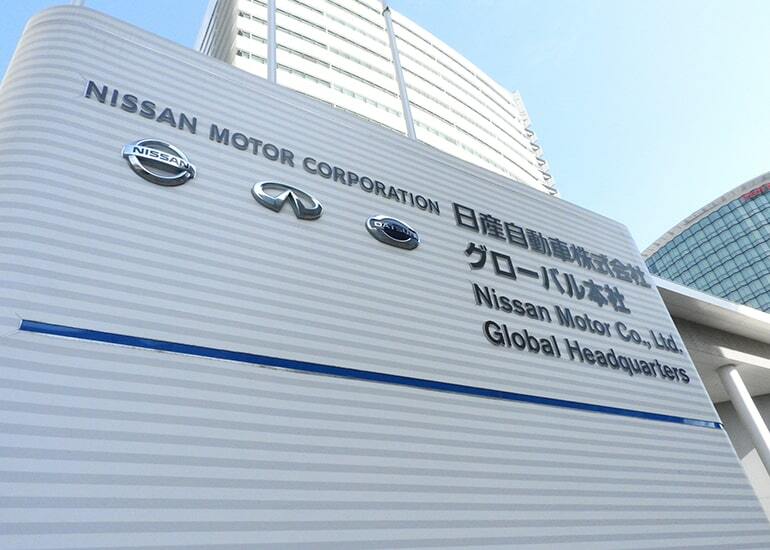 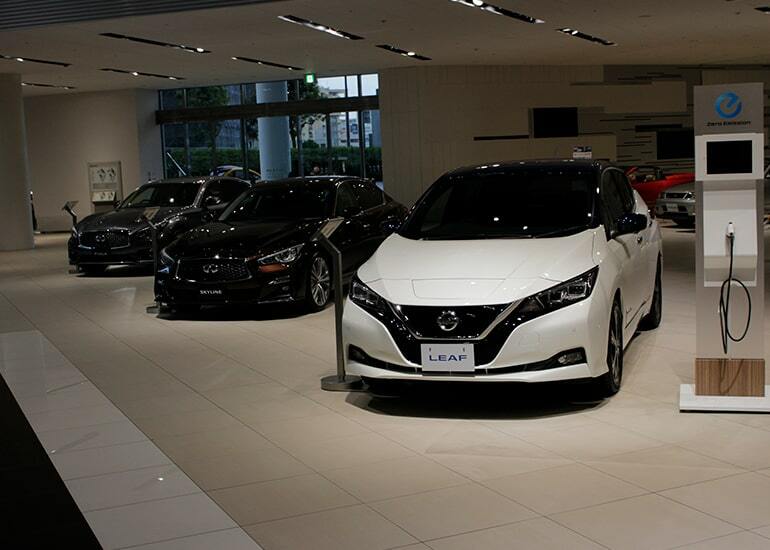 We would like to thank Nissan Motor Co. for providing access to this wonderful venue for many years. 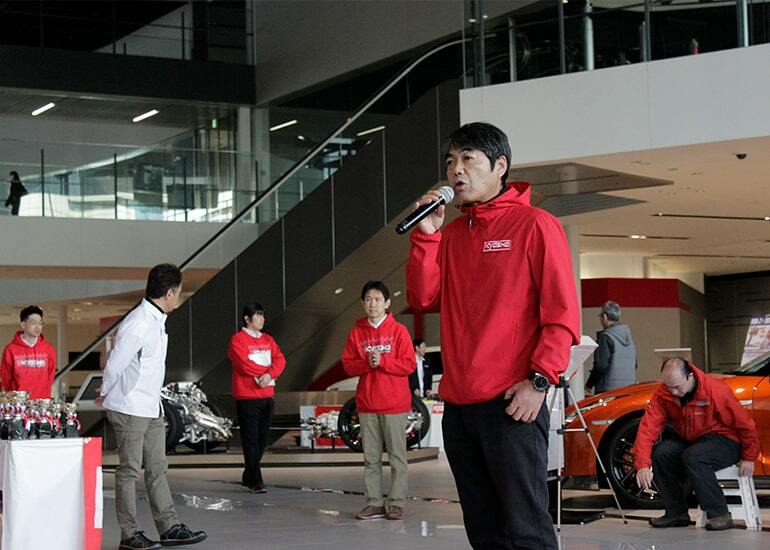 Topic 140-minute endurance race tests the power of the whole team, but who gets the right to represent? 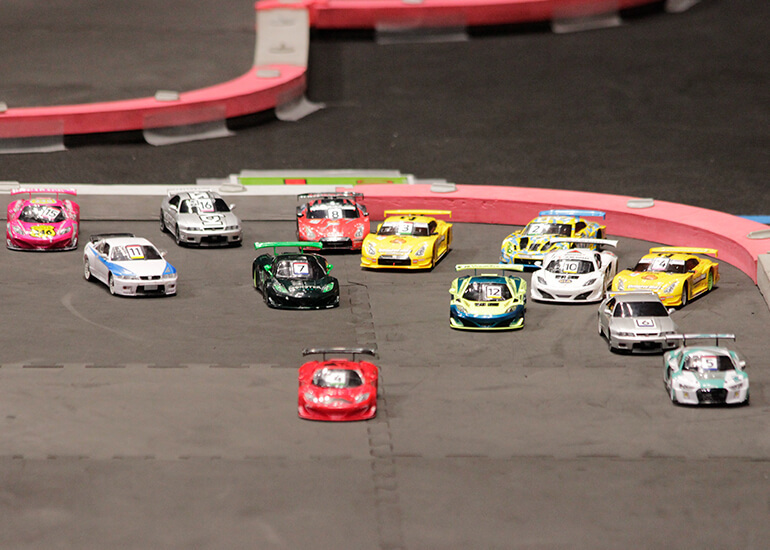 After the success of the “Join In Time Attack” at the previous final, this year’s Final Championship featured a special, “MINI-Z 40-Minute Endurance Race”. 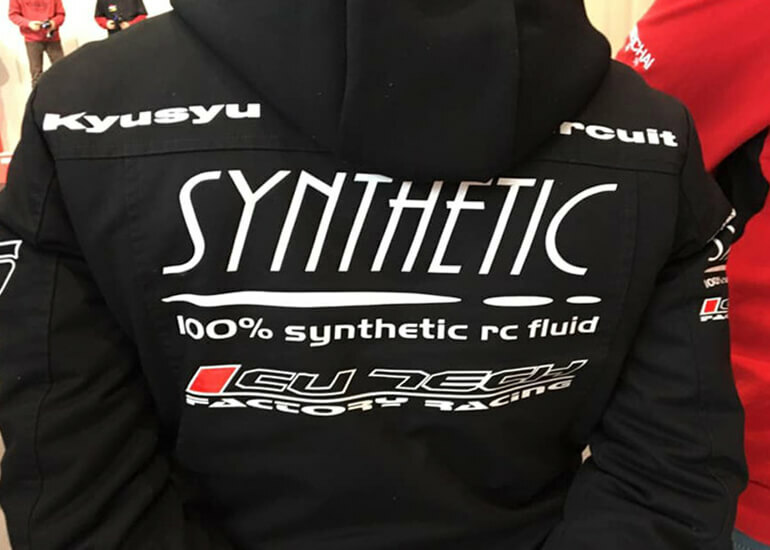 Each of the 16 teams consisting of 2 drivers and 1 pit crew and were required to change drivers and batteries at set times, so the race format tested not only the skill of the drivers but also teamwork. 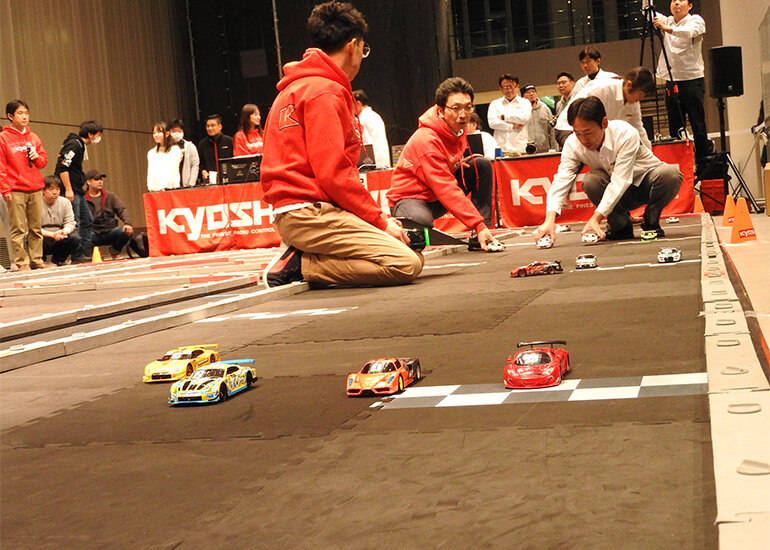 From the many rare machines seen at the start, Team KYOSHO led out and held top position with a 2-lap lead over team OWL to the midpoint in the race. 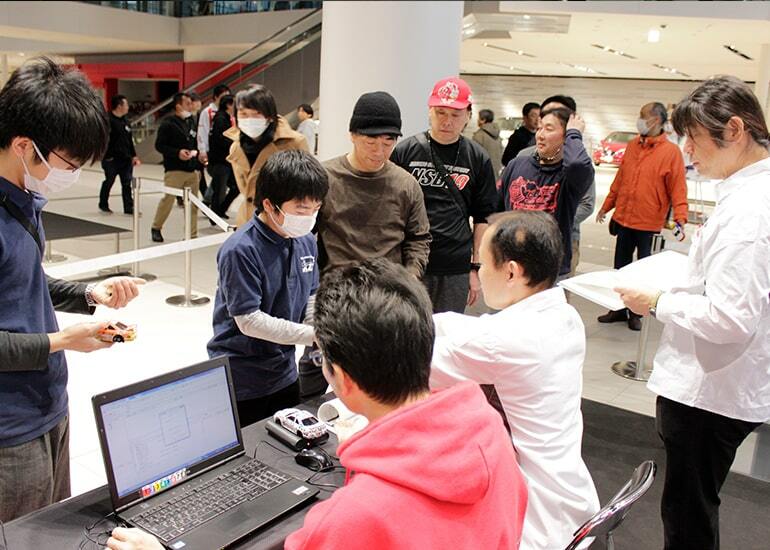 However, after battery and driver changes at the 20-25 minute point, the complexion of the race also changed. 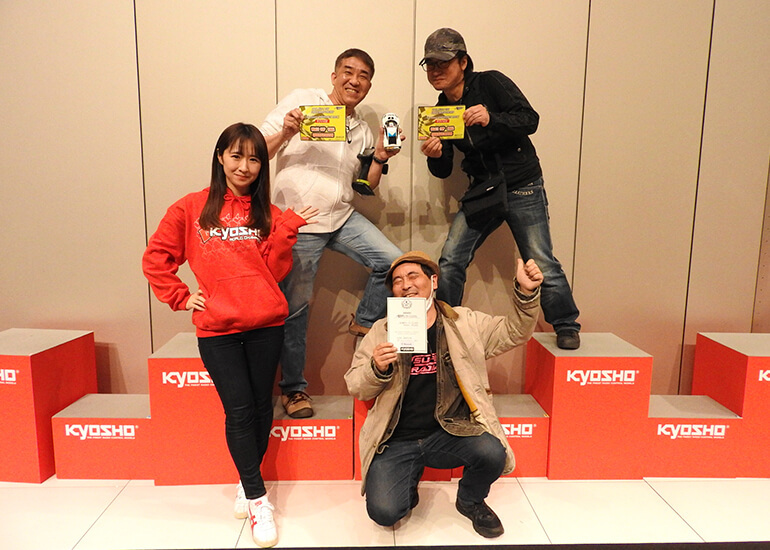 OWL was on the charge and took the lead from Team KYOSHO with 11 minutes remaining, and then held their lead through to the finish. 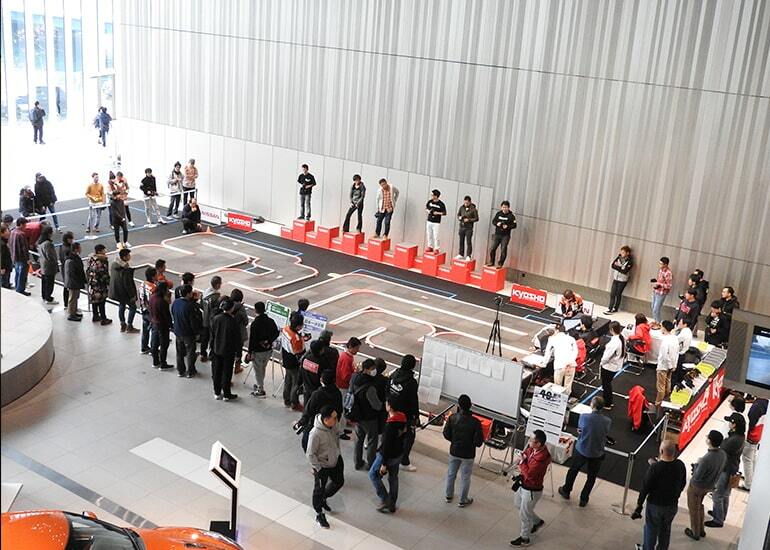 7 Team KYOSHO 142 40'13.620"
15 TEAM RC 29 11'29.540"
For the Final Championship, the drivers from China (Beijing, Hong Kong) and South Korea joined the battle with the local Japanese entries. 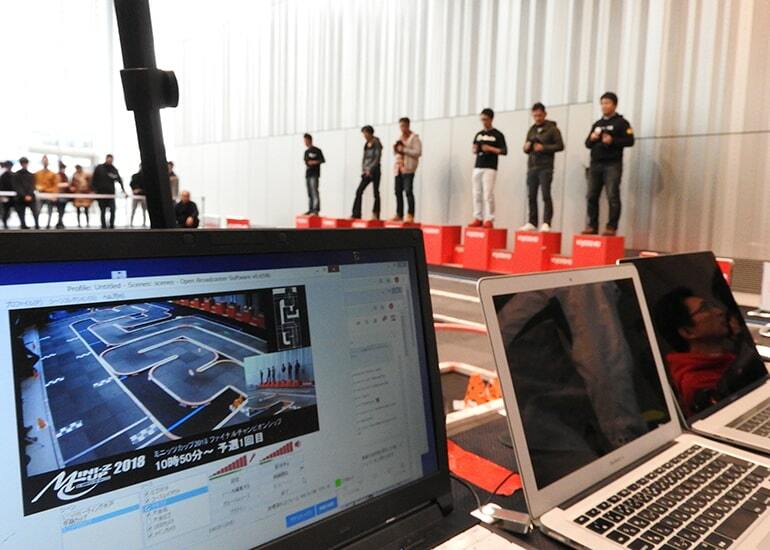 On the second day, Zhang Jin Heng from Beijing claimed victory in the NISSAN Fan Class! 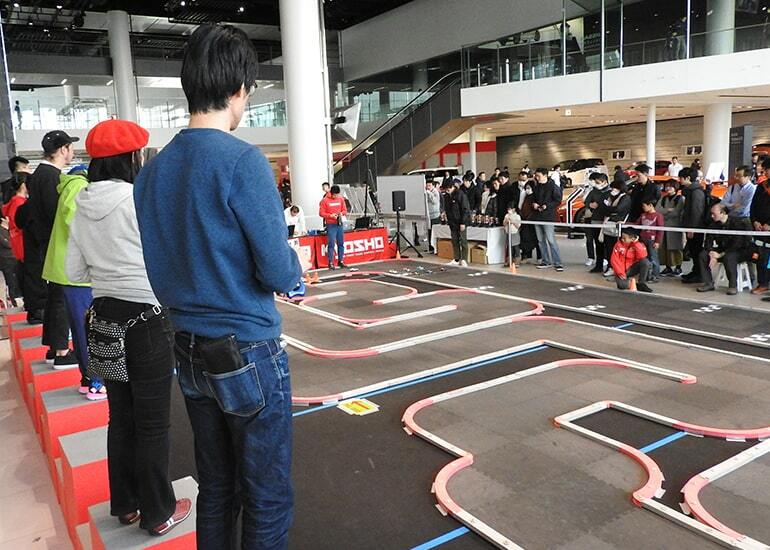 International drivers competed strongly in all other classes, rapidly closing the gap with the best Japanese drivers. 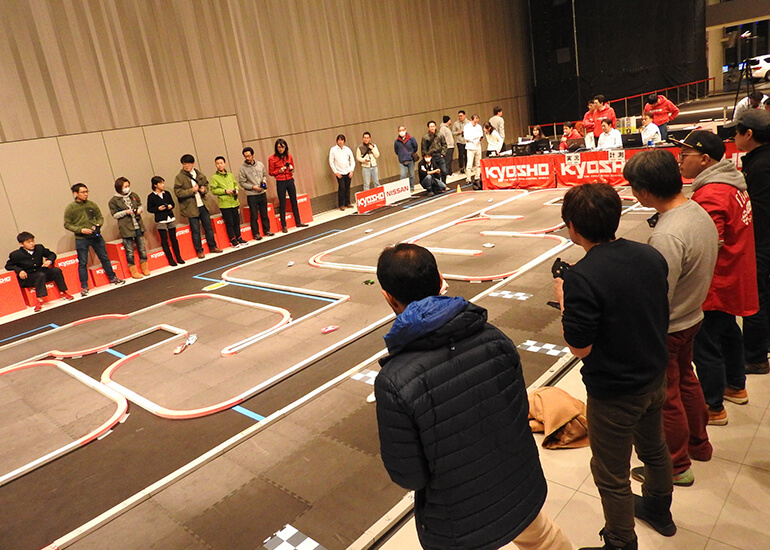 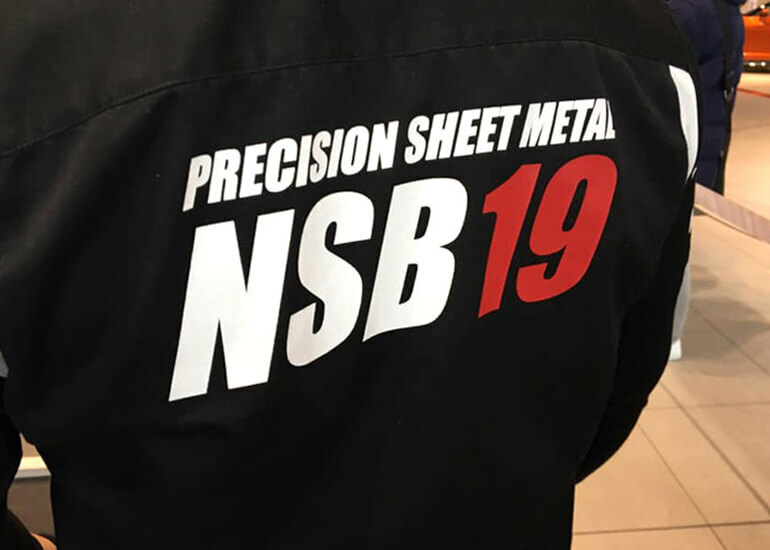 The fun was not limited to the racing action as the drivers and participants mixed with Kyosho staff to enjoy the social atmosphere of the Final Championship. 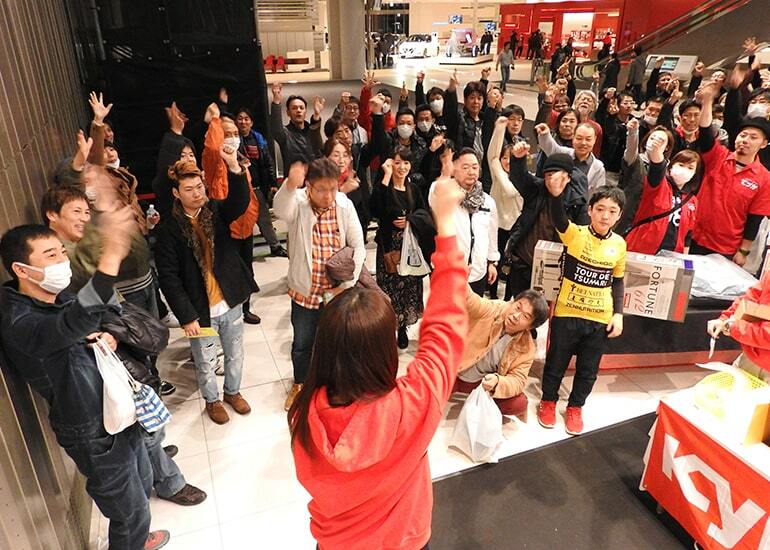 Following on from last year’s event, ‘Yui Yui Honpo’ opened a booth to support welfare services for people with disabilities in Asahikawa City, Hokkaido. 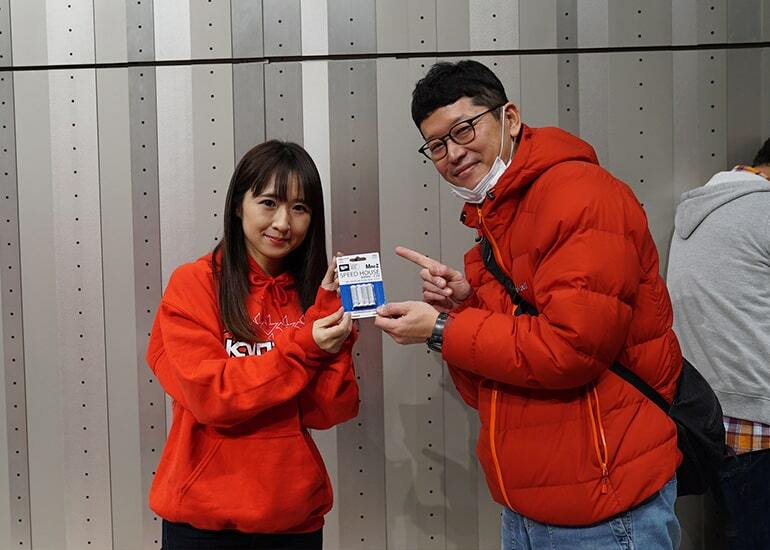 MINI-Z white body artist Mr. Yuichi Aoyama drew plenty of attention as he did last year, and dot pattern painter Mr. Yukiya Makita enjoying watching the action with Yui Yui Honpo representative Mr. Masato Nonomura. 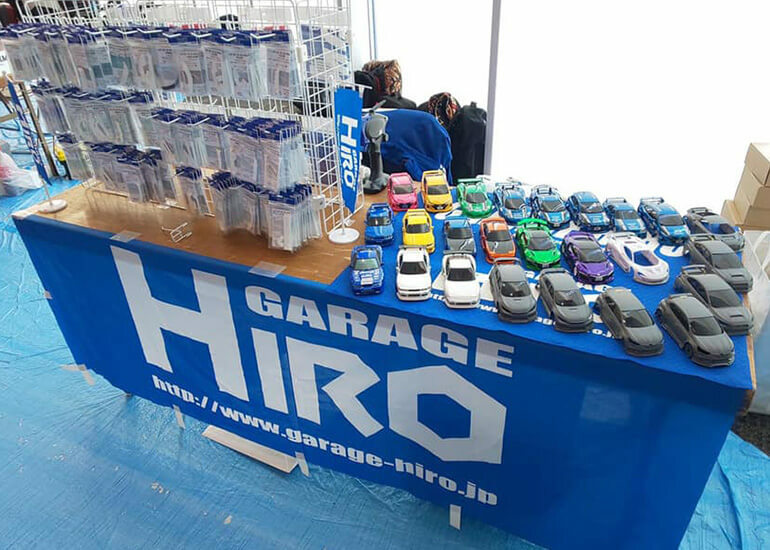 Visitors were deeply impressed by the wide variety of car body art on display, including MINI-Z bodies decorated by Mr. Aoyama and Mr. Makita. 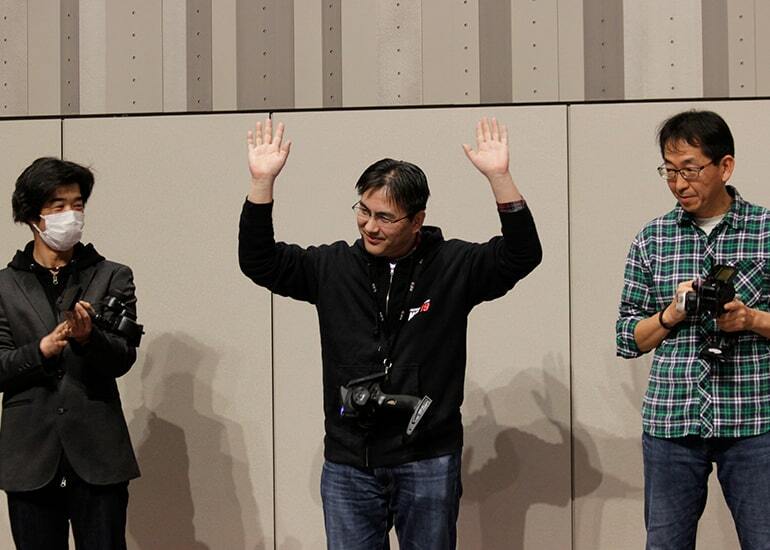 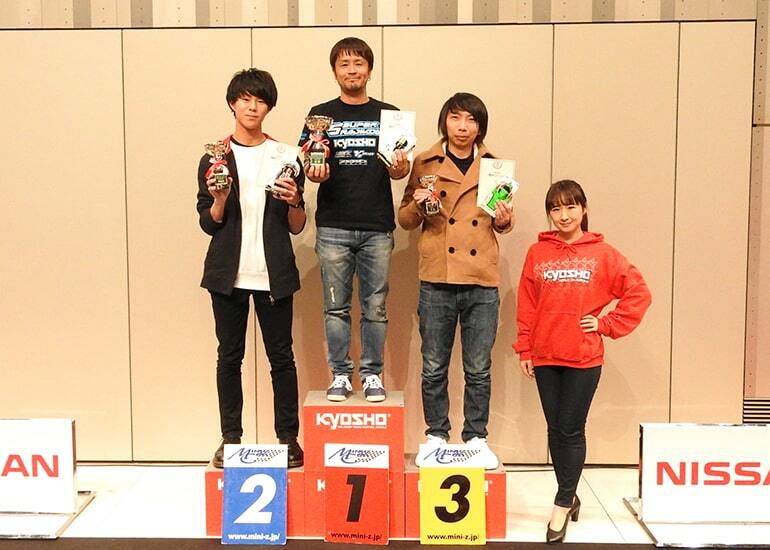 Topic 4Special award for Mr. Shinobu Asaba and Mr. Toshikazu Karube for 16 consecutive years of MINI-Z Cup participation. 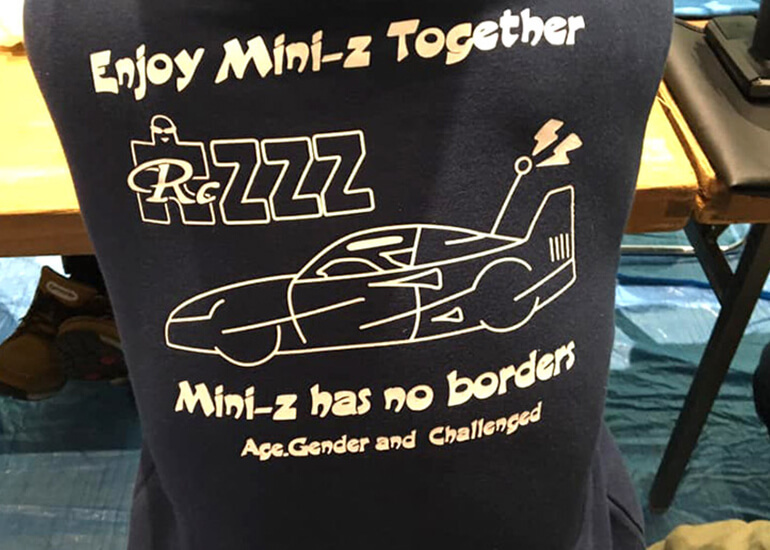 The 16th MINI-Z Cup Final Championship in 2018 celebrates all MINI-Z drivers. 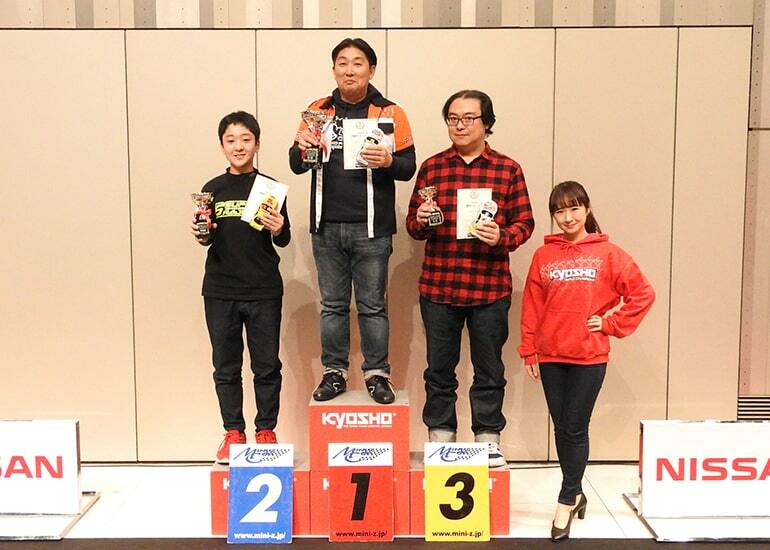 As a surprise at this year’s Final Championship, a special award was given to Mr. Shinobu Asabe and Mr. Toshikazu Karube for participating in every MINI-Z Cup final! 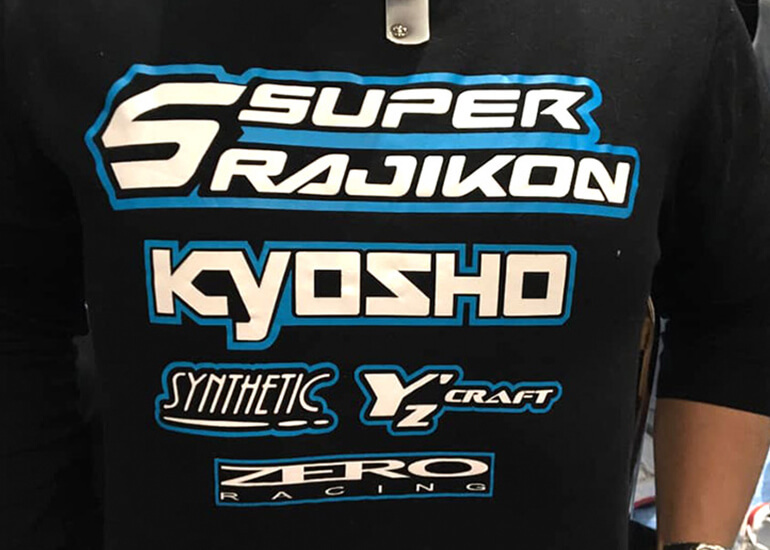 Kyosho President, Katsumi Watanabe, delivered a moving speech acknowledging their support and presented them with an original Kyosho jacket. 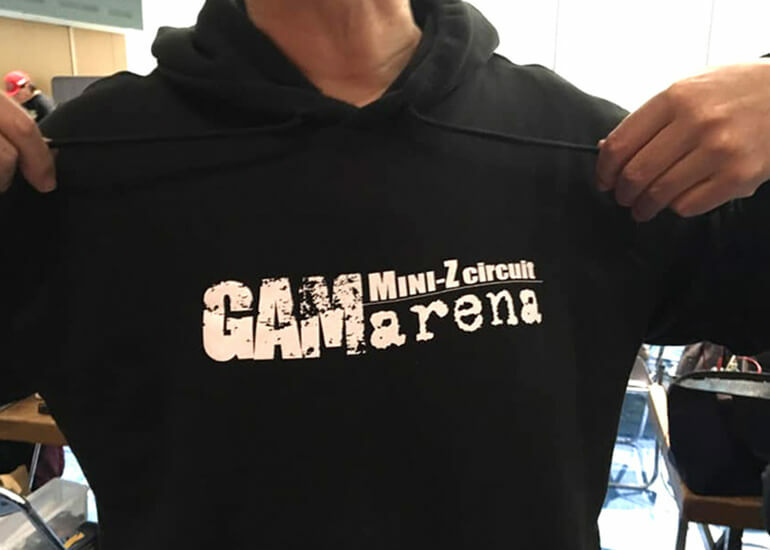 We thank both Mr. Asaba and Mr. Karube as well as all MINI-Z users for their continued support of the MINI-Z and the MINI-Z Cup. 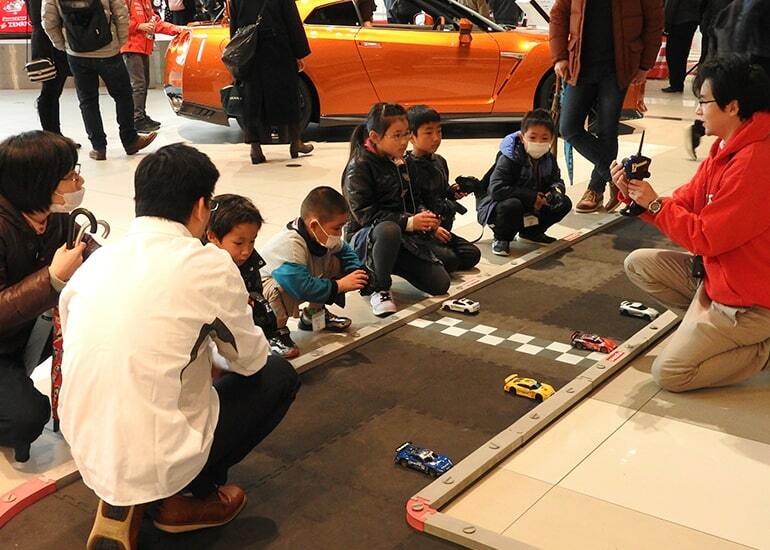 On Day 2 of the Final Championship, the ‘MINI-Z Meeting NISSAN Fan Class’ race was open to 25 entries including women and children. 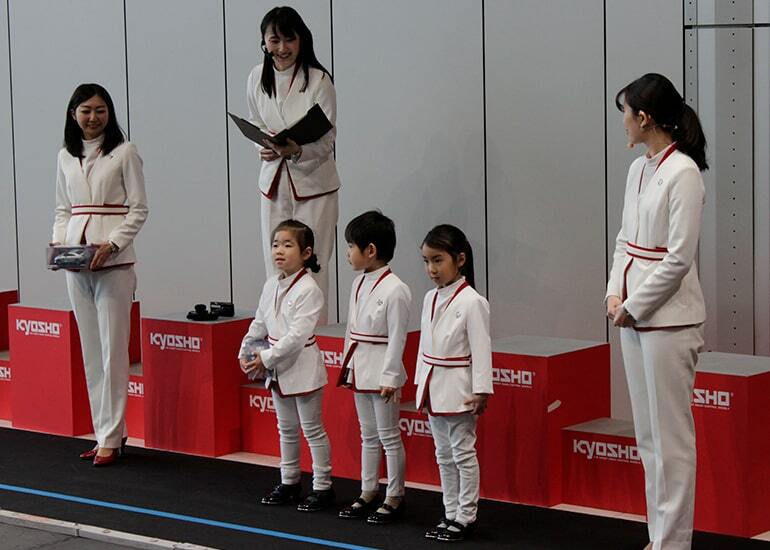 Zhang Jin Heng and Meng Ke Xuan from Beijing, China also competed with Zhang winning the race at the end. 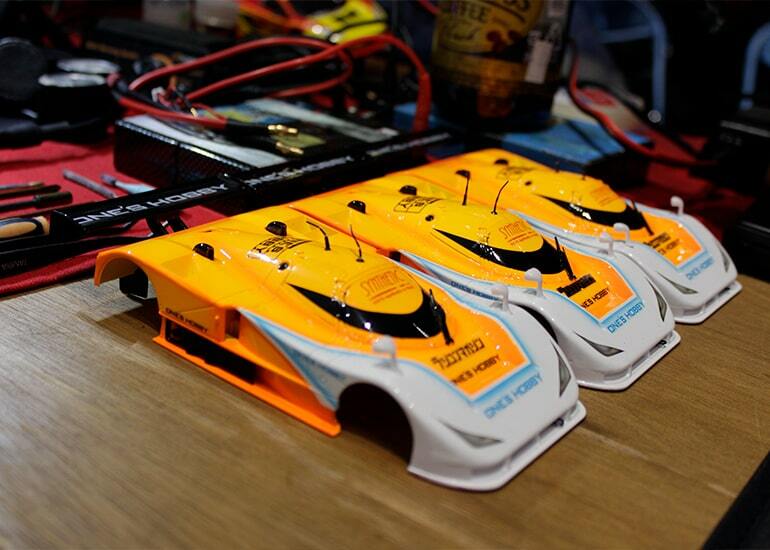 1 Zhang Jin Heng 37 8'09.270"
2 Meng Ke Xuan 37 8'13.620"
3 稲垣 綾子 36 8'03.840"
4 藤浦 明美 36 8'08.970"
5 Li Yao 34 8'05.900"
6 井谷 静香 34 8'05.950"
7 松井 徹 34 8'08.750"
8 大澤 慎一郎 30 8'01.650"
Mr. Asaba of burst out from starting pole to lead the opening lap, but unfortunately flipped over on the 3rd lap and dropped down the rankings. 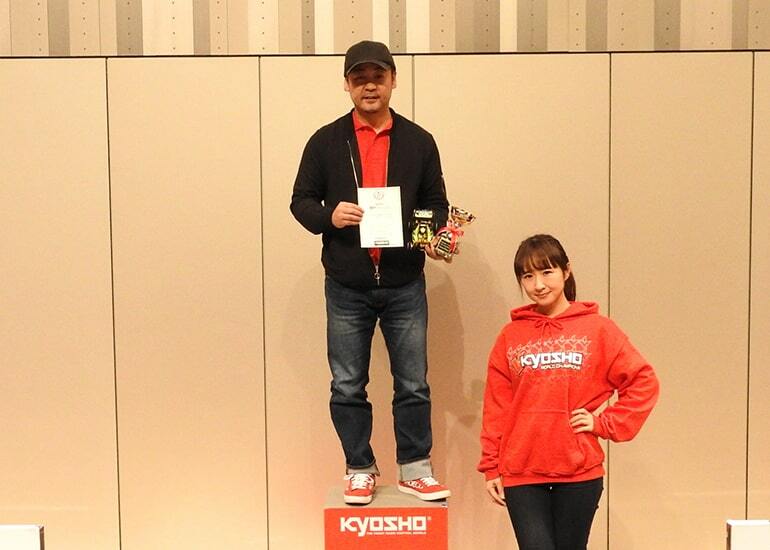 Mr. Shibasaki who started in 4th took the lead with Mr. Karube following in 2nd and Mr. Asaba in 3rd place. 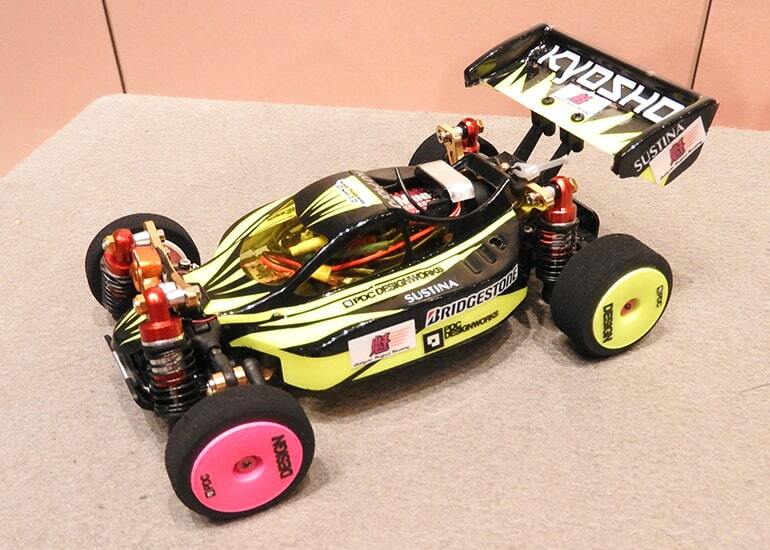 Mr. Shibasaki and Mr. Karube's nose-to-tail battle lasted for a while, but gradually Mr. Shibasaki built a gap. 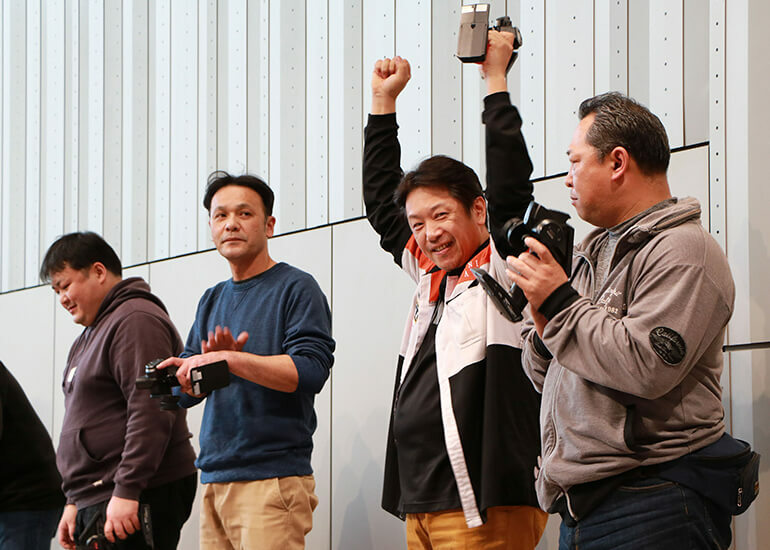 Feeling the intense pressure from Mr.Asaba and Mr. Karube in hot pursuit, Mr. Shibasaki’s mistakes kept the race tight, but he held his form and claimed victory in the end. 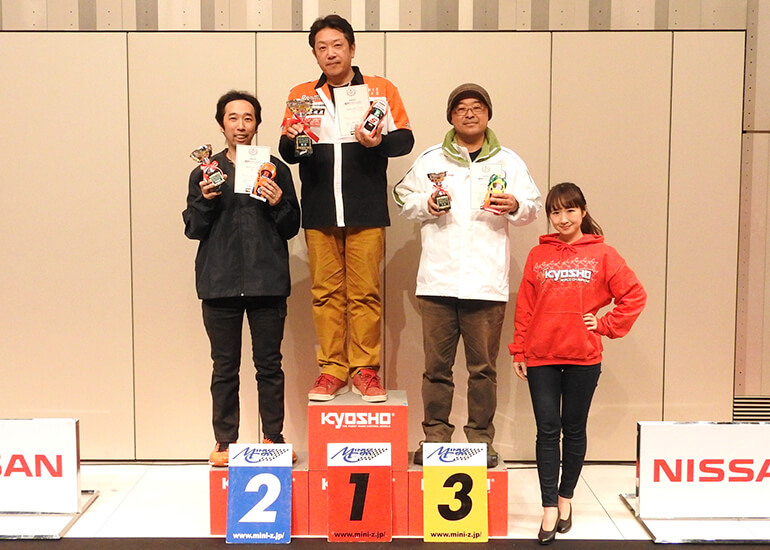 1 柴崎 雄志 43 8'05.220"
2 浅場 忍 43 8'06.040"
3 軽部 俊和 43 8'06.700"
4 高山 達哉 42 8'02.250"
5 猪股 正樹 41 8'00.550"
6 安田 計次朗 41 8'02.800"
7 佐伯 昭彦 41 8'03.300"
8 内田 幹人 41 8'08.990"
An intense 3-way battle ensued from the start between Mr. Okita, Mr. Fukumoto and Mr. Koizuimi. 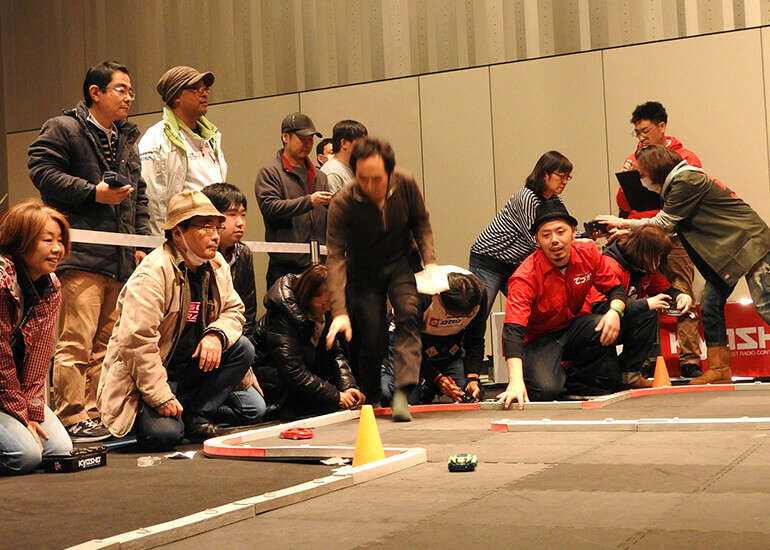 1 minute into the race, Mr. Okita flipped and dropped down the field. 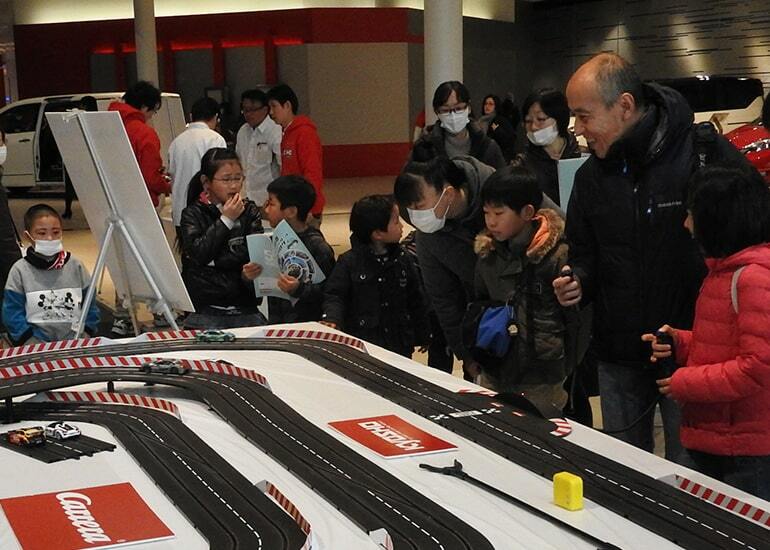 Then 2 minutes into the race, Mr. Koizumi flipped over into the last corner. 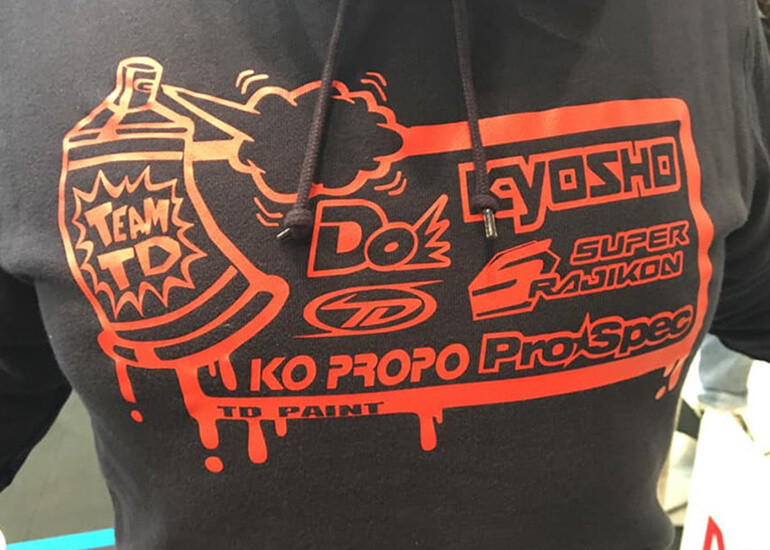 As a result Mr. Fukumoto found himself in the lead, but with Mr.Okita hot on his tail after an incredible comeback after flipping over with Mr. Fukumoto chasing. 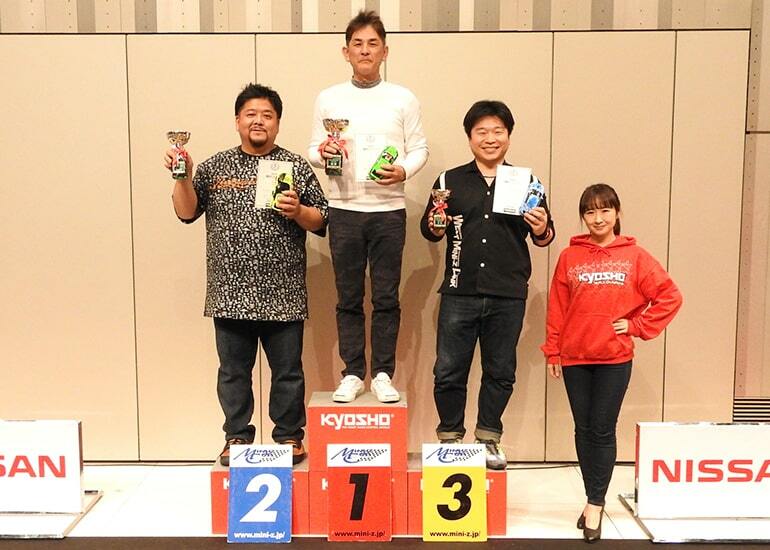 After such a frantic start to the race, Mr. Okita settled into a fast pace and took the lead from Mr. Fukumoto down the back straight and kept the lead to claim the win. 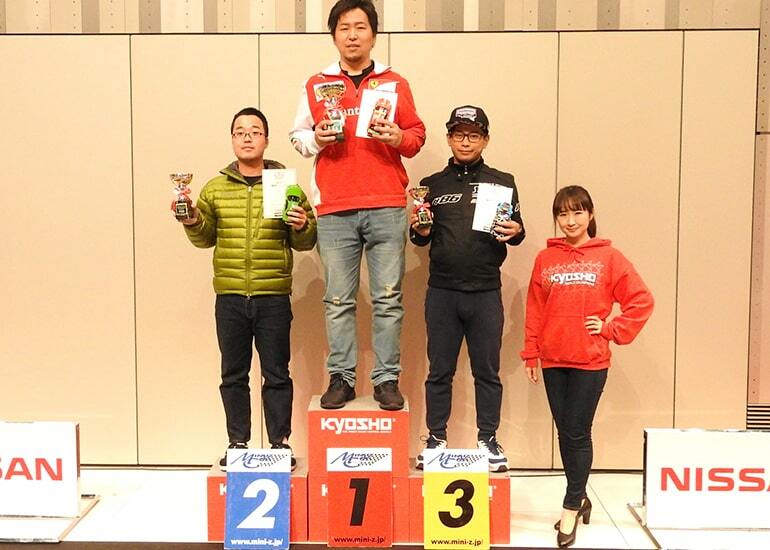 1 大北 勝信 41 8'01.250"
2 小泉 学 41 8'09.090"
3 畑山 明陽 41 8'10.390"
4 福本 大地 41 8'11.300"
5 谷　聡 40 8'00.710"
6 小枝 和洋 40 8'07.280"
7 杉尾 隆史 40 8'12.010"
8 筒井 淳二 39 8'00.970"
With a strong start from pole position, Mr. Koizumi flipped leading into the back straight on the 1st lap and dropped down the field in a shock opening in the A main final. 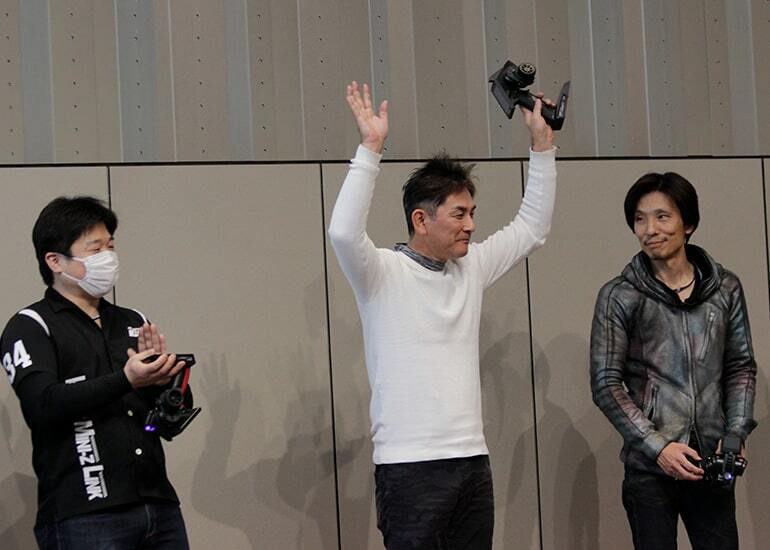 This allowed Mr. Sugawara to take the lead but with Mr. Koizumi right behind. 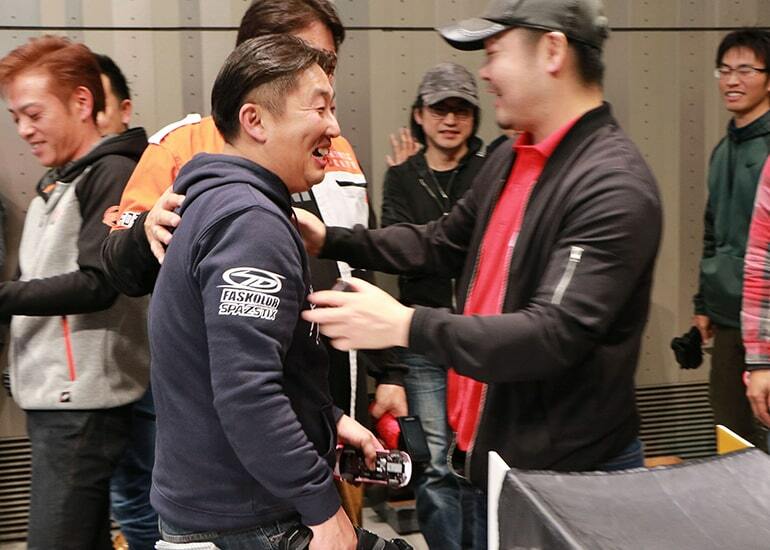 Both drivers matched each other’s lap times but the flawless control of Mr. Sugawara kept the door tightly closed as he led Mr. Koizumi over the finish line by a mere .58 seconds to claim the Narrow Touring Class title. 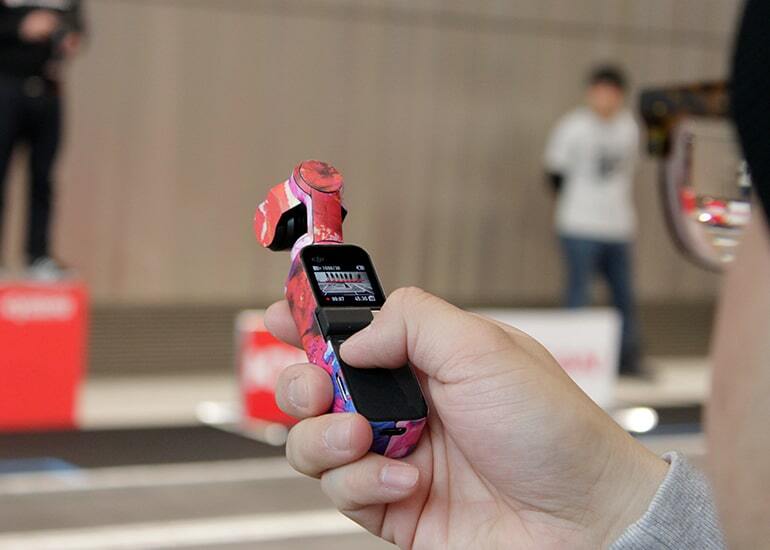 1 菅原 光輝 45 8'02.320"
2 小泉 大晴 45 8'02.900"
3 小森 健男 44 8'03.700"
4 前原 康佑 44 8'04.970"
5 中村 直隆 44 8'05.320"
6 近田 積治 44 8'06.890"
7 原　博昭 44 8'07.870"
8 笠原 善徳 43 8'08.600"
The A Main final was an intense contest from the start between Mr. Nakamura and Mr. Katayama. 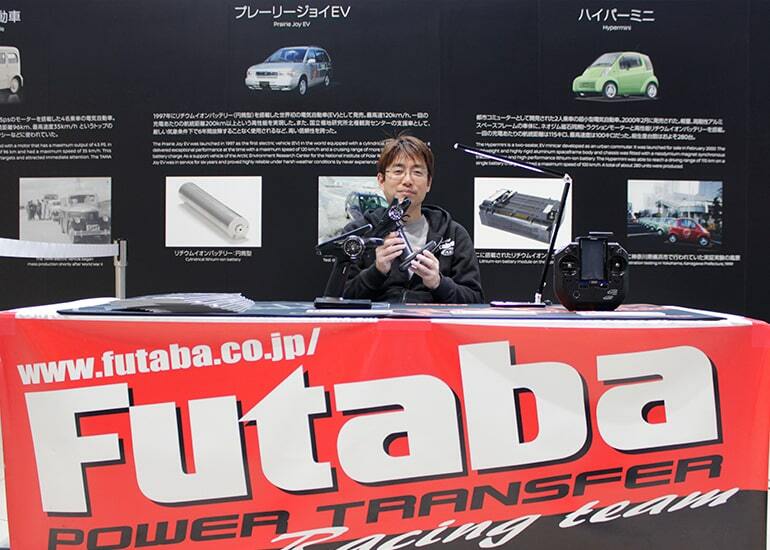 As Mr. Nakamura demonstrated his intent with two consecutive super laps of 9 seconds, the pressure forced 2nd place Mr. Katayama into some errors. 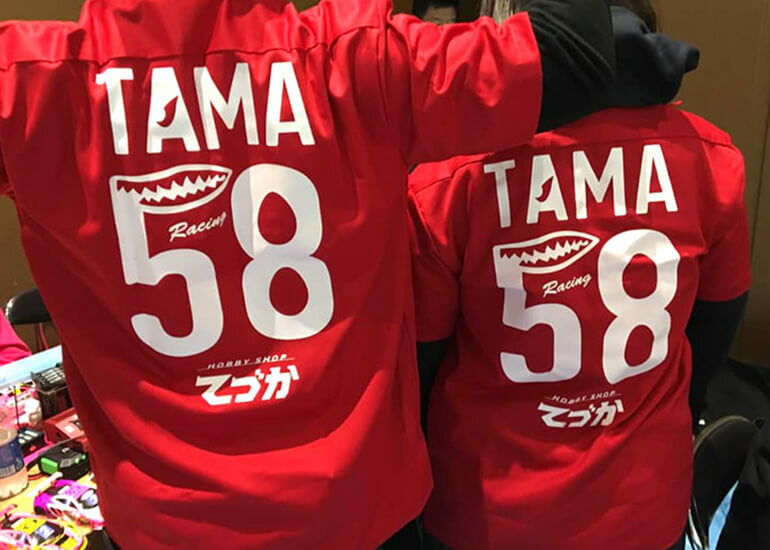 While Mr. Nakamura built a safe lead, Mr. Yamaki made a charge into 2nd and pushed Mr. Nakamura nose to tail into the final lap. 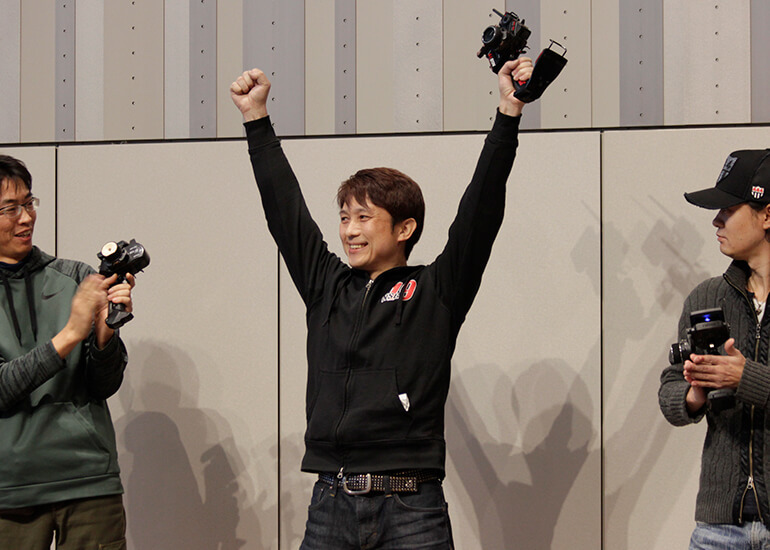 Mr. Nakamura maintained his composure to win under intense pressure from Mr. Yamaki. 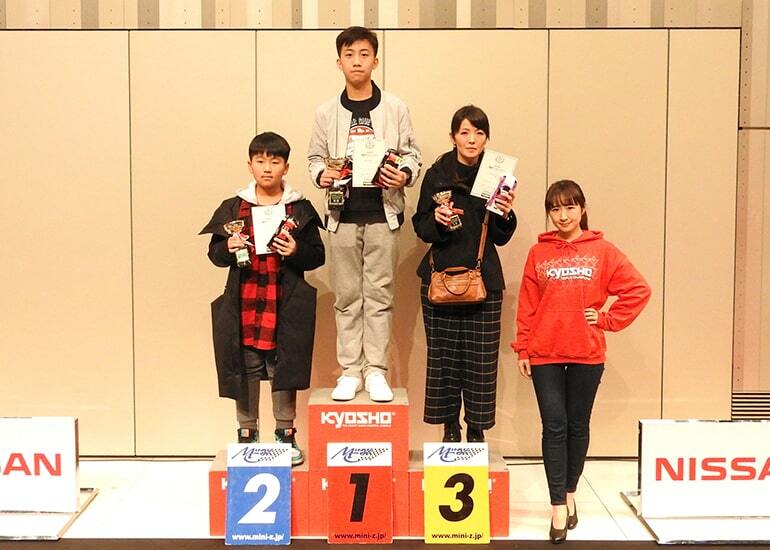 1 中村 克也 48 8'09.260"
2 山木 幹生 48 8'09.840"
3 片山 和久 47 8'04.510"
4 桑田 貴透 47 8'07.870"
5 中尾 友和 46 8'00.010"
6 植松 秀和 46 8'02.550"
7 小蓑 正樹 46 8'10.660"
8 勝田 隆之 45 8'06.940"
With a dominant performance in qualifying, Mr.Tsukamoto lead out with last year’s champion Mr. Mizudome pursuing in 3rd. 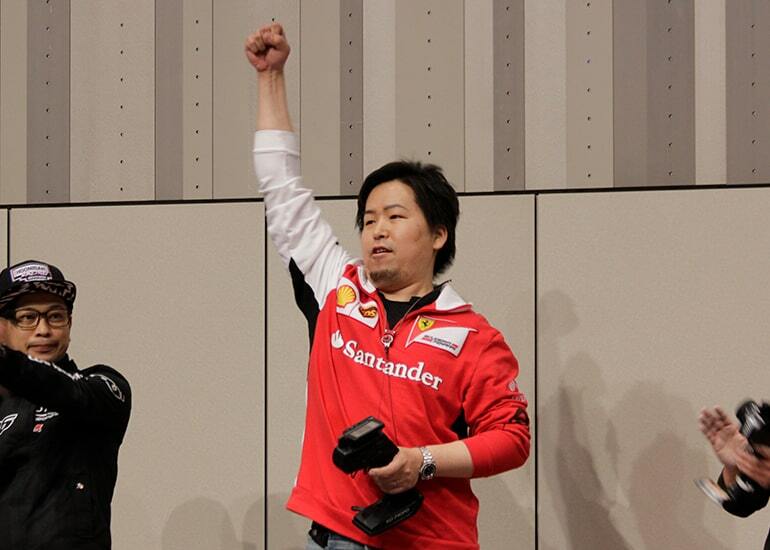 Both drivers swapped the lead repeatedly in a tight battle but with 3 minutes remaining, Mr. Mizudome lost time when he flipped over. 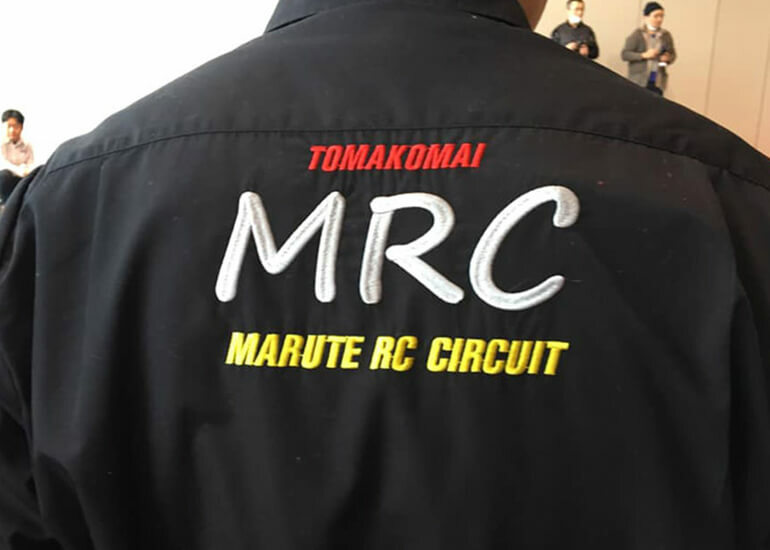 With the race seemingly lost, Mr. Mizudome staged an amazing comeback with repeated 9-secone laps to take back the lead with 15 seconds remaining to claim back-to-back victories in the Open Class. 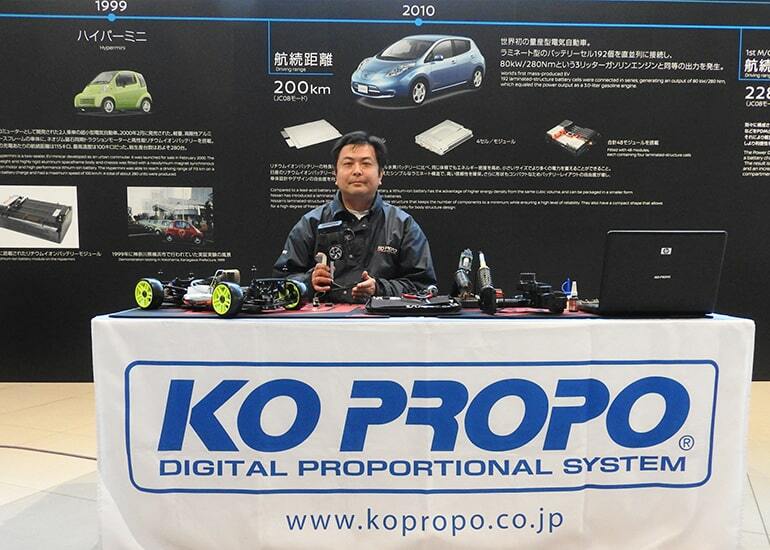 1 満留 淳 49 8'04.420"
2 塚本 凌平 49 8'05.820"
3 岩田 直哉 48 8'01.870"
4 上林 博 48 8'02.370"
5 内田 真悟 47 8'08.320"
6 浅川 典克 46 8'07.840"
7 矢田 信夫 45 8'00.380"
8 中村 雅之 44 8'11.630"
Sitting in pole was Mr. Nakaharu who posted the TQ with a 6-second gap to 2nd qualifier, Mr. Fujimoto. 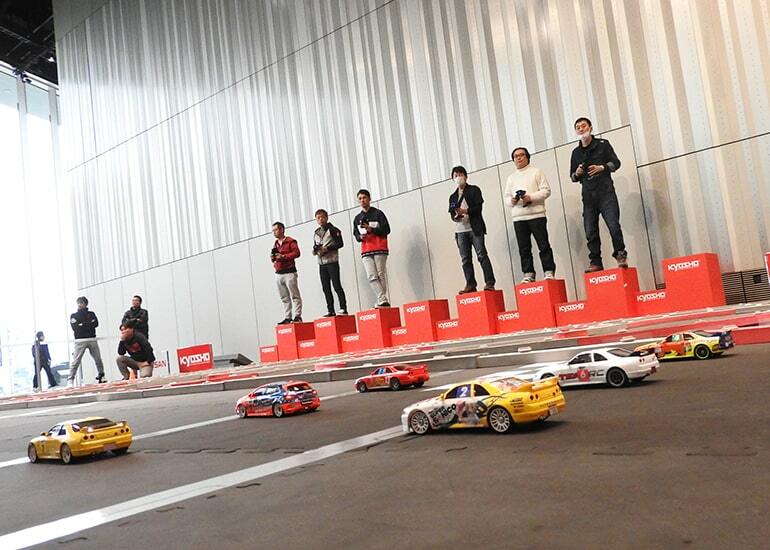 Mr. Nakaharu showed immaculate form with repeated 13-second laptimes to take a commanding lead. 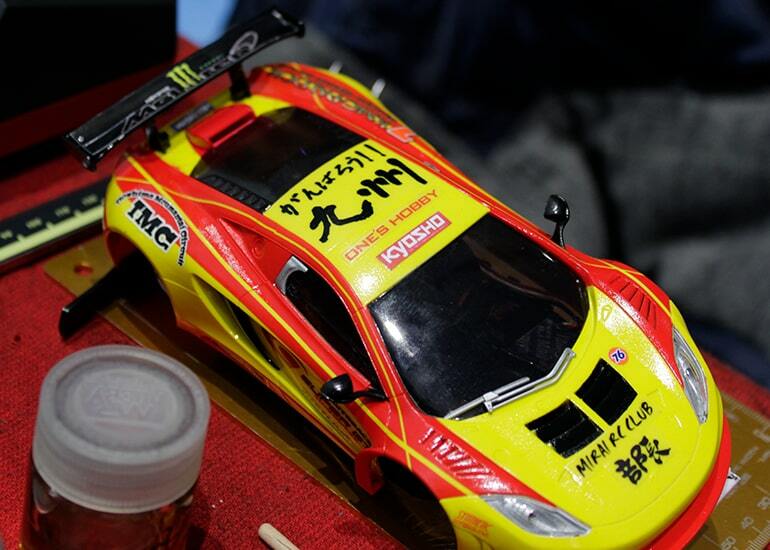 He was untouchable and drove from pole to the finish line a lap in front of Mr. Morita in 2nd place. 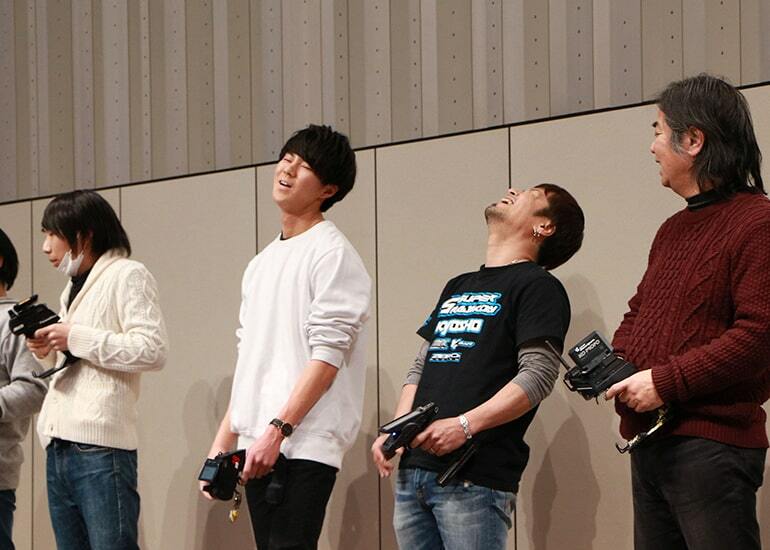 1 中春 正太 34 8'05.770"
2 森田 昇一 33 8'03.130"
3 藤本 昌宏 33 8'04.630"
4 山崎 洋平 32 8'09.000"
5 山田 和弘 32 8'12.570"
6 小池 亘 32 8'13.380"
7 山川 徹 31 8'09.700"
8 藤井 崇司 29 8'12.050"
An undulating course broken up with regular jumps ensured the buggy class was an entertaining spectacle of 3-dimensional action. 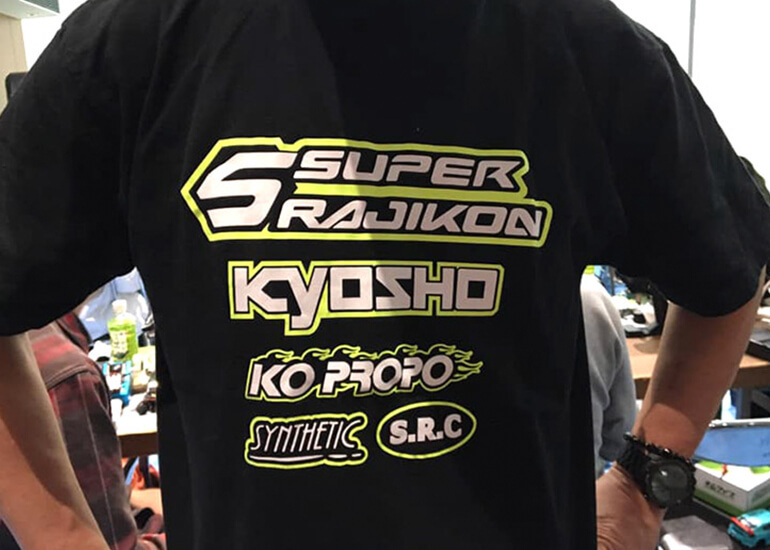 The A Main final was a showcase of buggy performance with regular crashes and movement through the leaderboard. 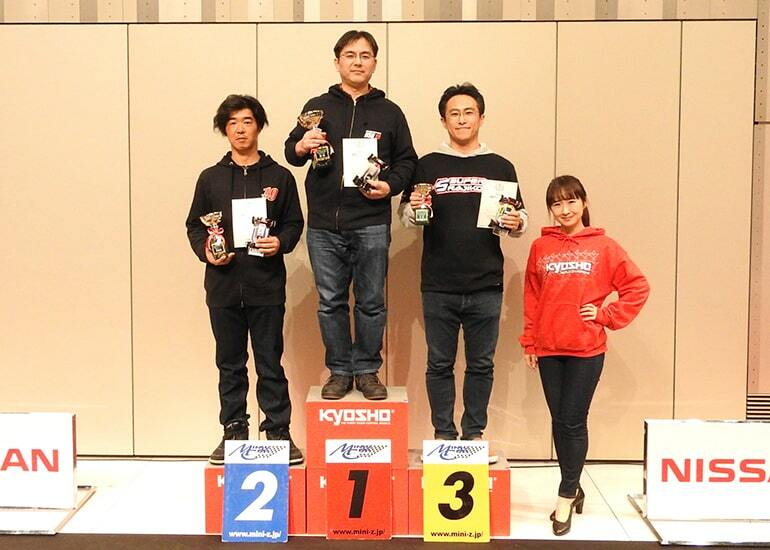 Mr. Mase led the field out from pole position to dominate the race and finish 1 lap in front of 2nd place Mr. Deguchi, who qualified through the B Main. 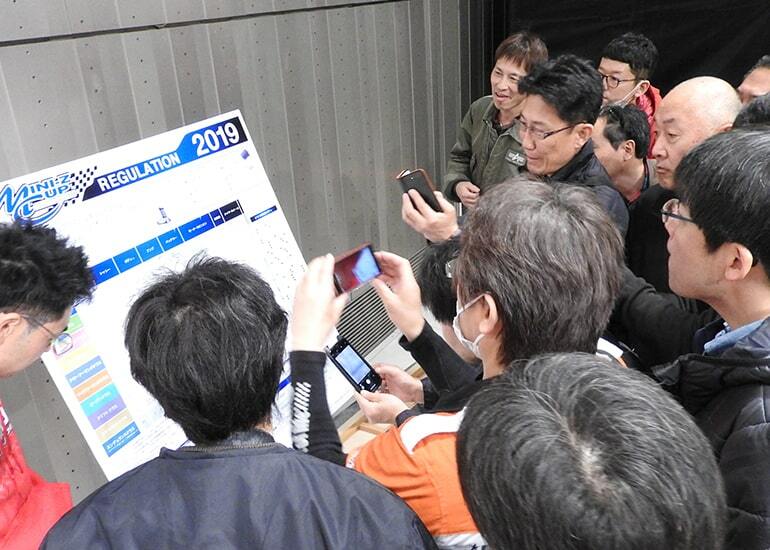 1 間瀬 信吾 32 8'01.610"
2 出口 尚也 31 8'07.930"
3 田宮 努 31 8'09.440"
4 岩田 満 30 8'04.130"
5 水口 英城 30 8'09.840"
6 藤浦 孝義 30 8'11.550"
7 坂井 光俊 29 8'04.020"
8 坂本 清 14 3'50.740"
Showcasing the multiple aspects of model hobby. 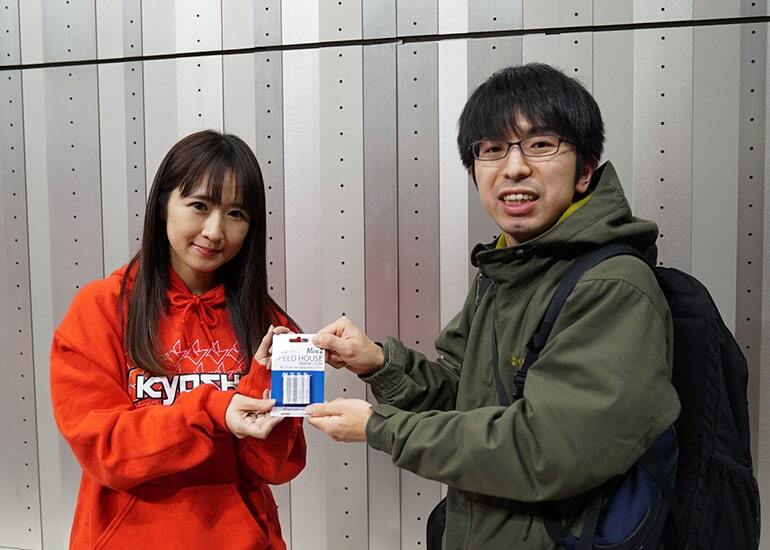 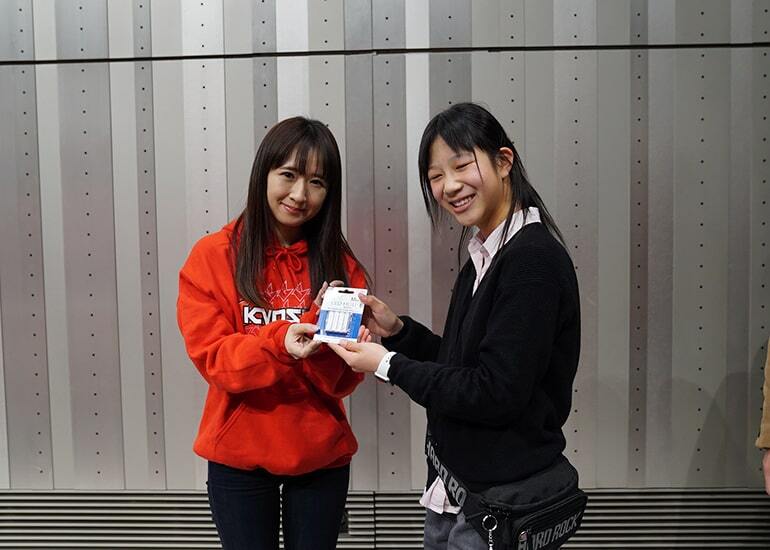 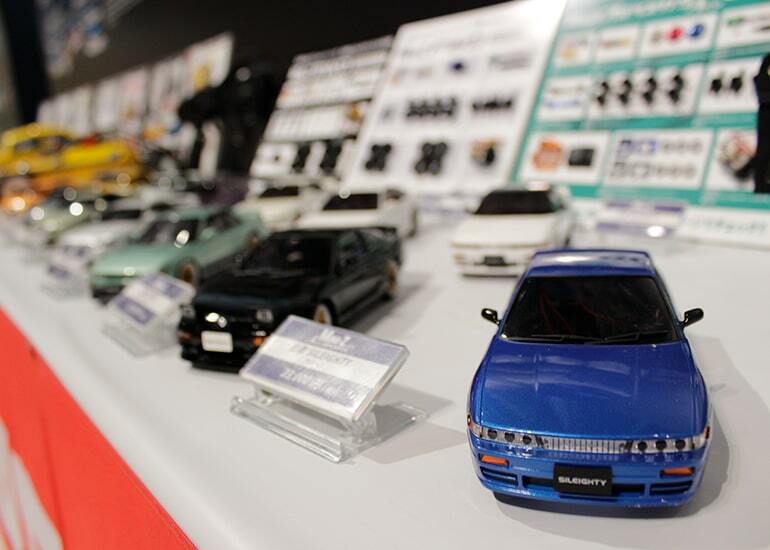 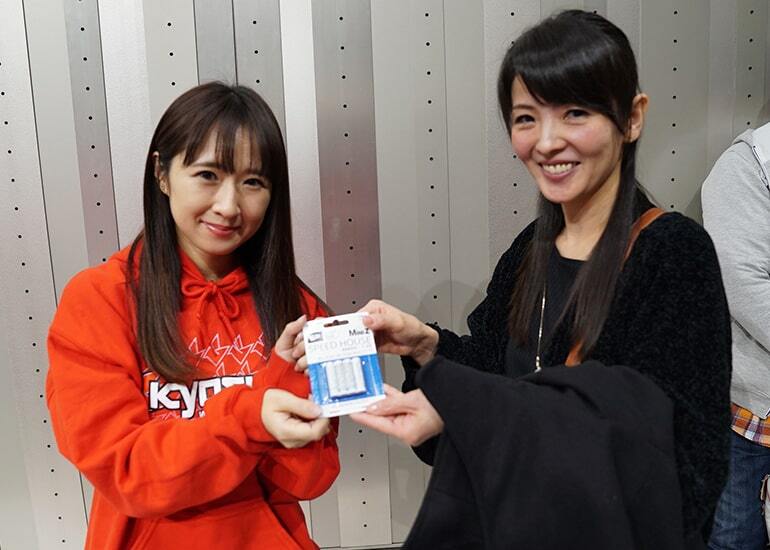 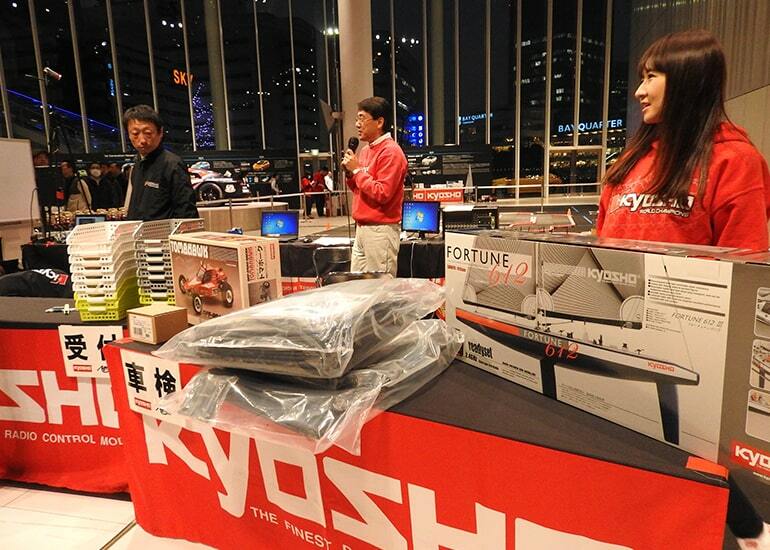 Kyosho continues to expand the appeal of the model hobby to a broader audience, even at this competition, with a free MINI-Z driving school, Carrera slot cars, Kyosho trash & treasure, mini car sale, paper-scissor-rock competition and a luxury prize for Miss Fairlady. 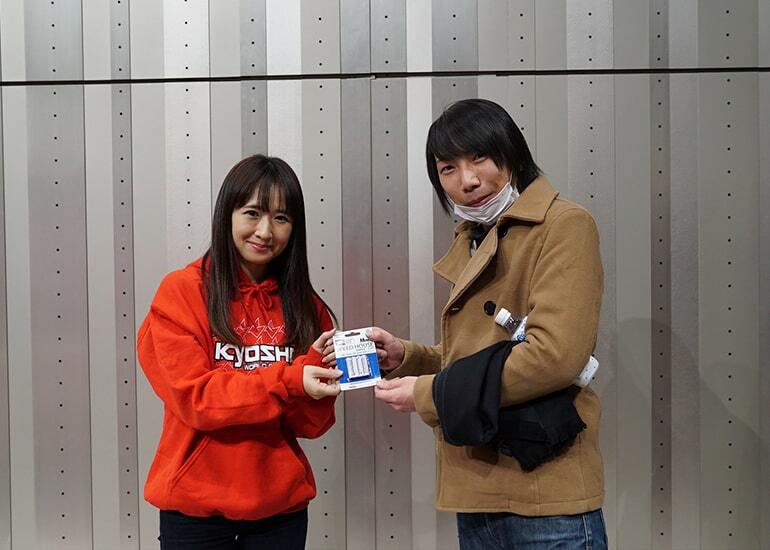 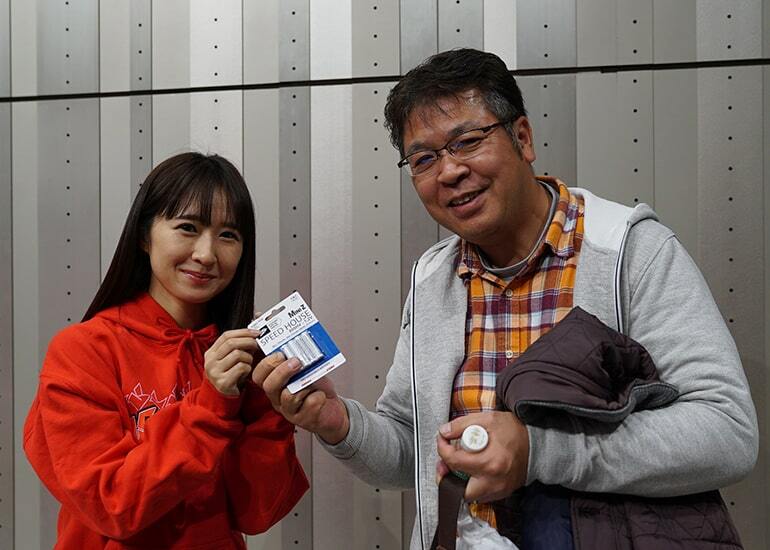 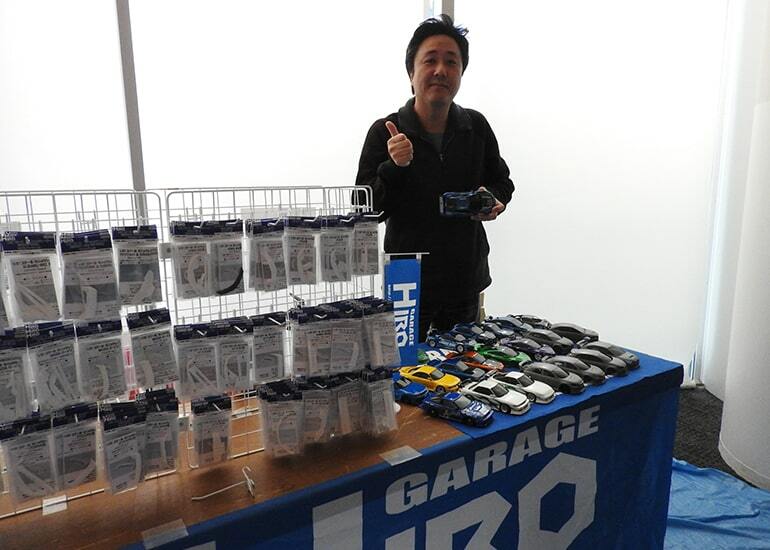 In holding the MINI-Z Cup Final Championship for the 2018 season of the MINI-Z Cup, Kyosho would like to thank the many participants from all over the country, and supporting organizations: Kondo Kagaku Ltd and Futaba Corporation who provided user support for 2 days, Garage HIRO and Yui Yui Honpo with exhibition booths. 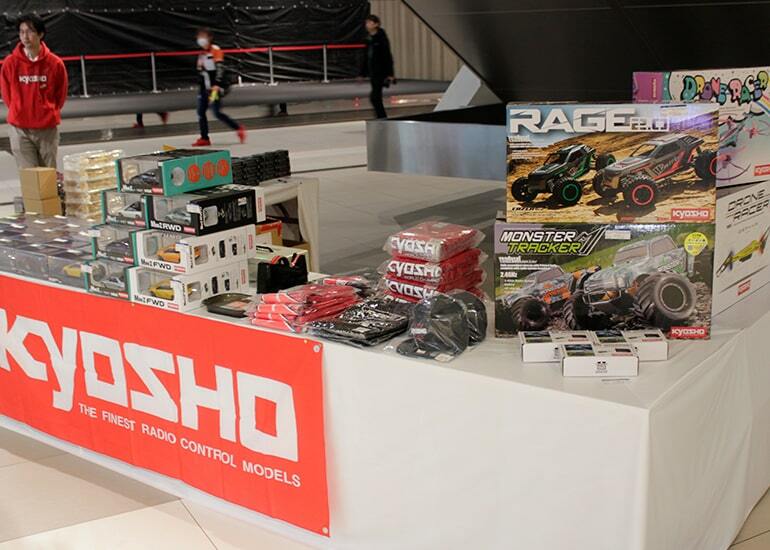 Kyosho appreciates everyone’s support and would like to say thank you very much.